A brace by Kei Kamara led Vancouver Whitecaps to a 3-2 win over the visiting Chicago Fire ending a two game losing streak and breathing some new life into their playoff hopes. Sandwiched between the Kamara goals was Jordon Mutch’s first as a Whitecap, while Nemanja Nikolic had tied things up for the visitors just before half time. Former Whitecap Tony Tchani scored a late one for the Fire to set up a nervy finish, but the ‘Caps held on for a much-needed three points. It looked from early on that the Whitecaps would keep pushing the ball into attacking areas with them creating a number of chances, and within the first five minutes Felipe forced Richard Sanchez into a stop with his shot from outside the box. A trio of misses by Kamara followed within four minutes, including a lob where he caught the keeper off his line but couldn’t keep the ball from going over the bar. Kamara redeemed his missed shots before the half hour mark when he was able capitalize on a parry by Sanchez from a Reyna strike to put Vancouver up on top, finishing from about a yard out. Three minutes later and it was nearly two when Davies was sent in a 1v1 with the keeper only to see his attempt saved and bounce of the woodwork. It looked as though the ‘Caps would be holding on to a lead going into the break but once again a defensive breakdown in the final minutes allowed Nikolic to convert a Kevin Ellis pass to draw the match even going into the half. That scoreline only lasted till the 47th minute when Efrain Juarez sent a ball over the backline into the path of Mutch who rounded the keeper, and after allowing a moment to let the ball settle, slotted into the open net. The Fire had a decent chance to tie it up around the hour mark but Brian Rowe was able to stop a shot from a tight angle from Aleksander Katai. 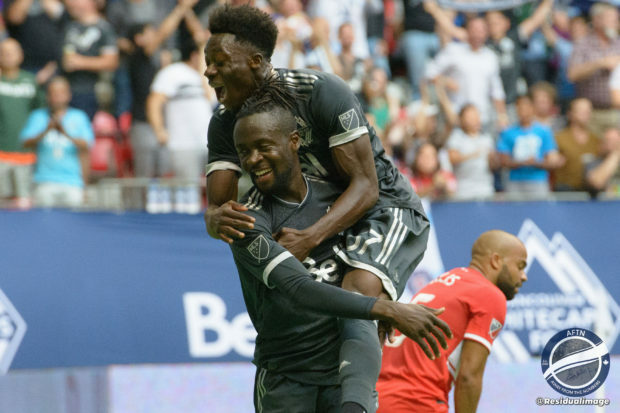 After a couple of failed counters by the Whitecaps, they were able to make one count as Alphonso Davies made a run to byeline and cut a pass back to Kamara who slotted one in for his second of the match. Surely that was the Whitecaps home and dry? Not with this team! With less than ten minutes to go, Chicago were able to pull one back when former Cap Tchani got hold of a failed clearance and fired a strike from just inside the box into the top corner of the net. The Fire were close to completing the comeback with a couple of minutes to go when a header from Jonathan Campbell was parried over the bar by Rowe. However they had a better chance in injury time when Nikolic was alone with the ball ten yards out and fired the ball over the net. It was a far nervier ending than it should have been for Vancouver but there was also clear relief when the final whistle sounded on the 3-2 victory. With the win the Whitecaps hold onto sixth spot in the Western Conference with Houston and LA Galaxy just a point behind, while Kamara’s first goal pushed him past Canadian Dwayne De Rosario into sole position of seventh place in the all-time MLS goalscorers. Vancouver will have their next two matches on the road, out east against DC United and then Cascadian rival Seattle, before returning home at the end of the month to host Minnesota United, with their two Canadian Championship semi-final matches squeezed in amongst all that. A busy time and every point will definitely count.